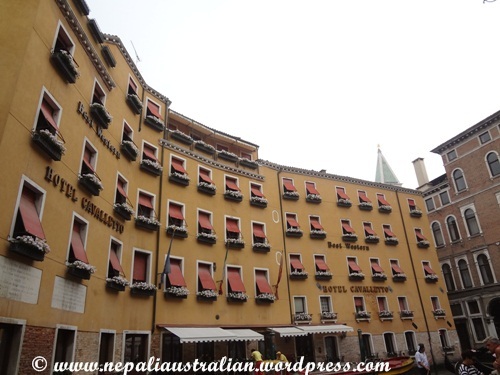 After our evening tour of Venice, we were ready to discover Venice in day light.On this day we had a nice breakfast in the hotel and headed to the lagoon again. 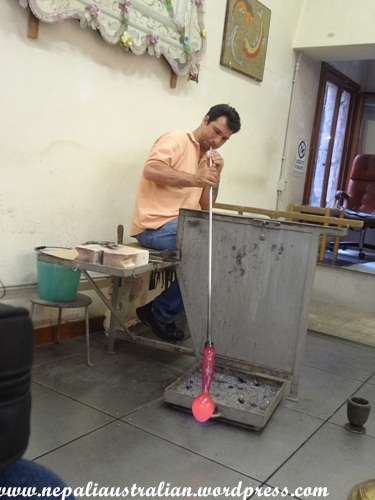 Once we were on the island, our first stop was to see the how they make Murano glasses. 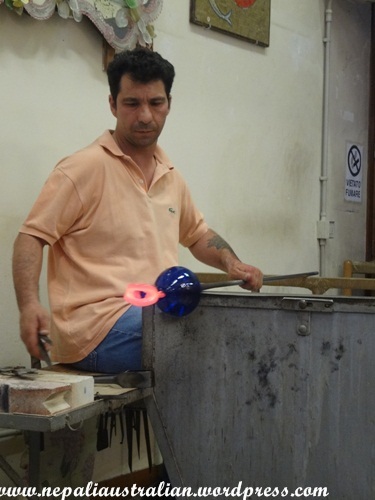 It was a short, but very impressive presentation in the glass workshop. 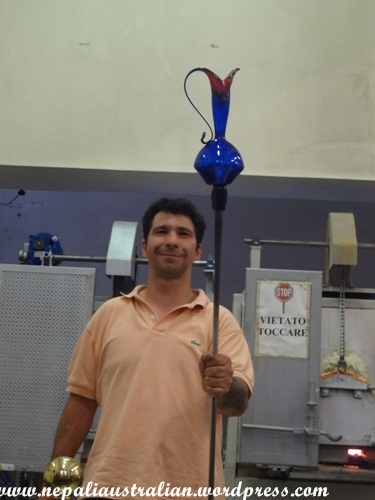 The glassmith first showed everyone how he creates a small vase from raw glass and then moulded it to make a beautiful flower shaped vase. It was really impressive that he could blow on the glass to shape the flower with all of the details in less than 5 minutes. From the workshop we were taken through a gift shop where they explained about decorative items and jewelleries. 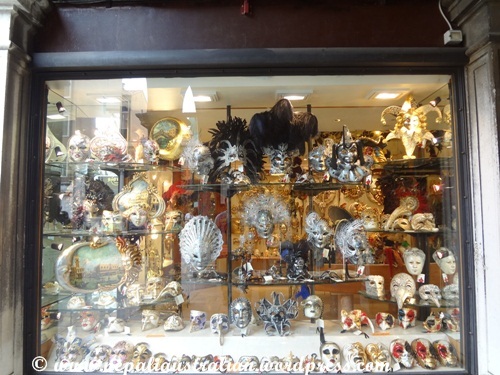 I didn’t buy anything but what we realized later is that every other store in Venice sells the glass items. 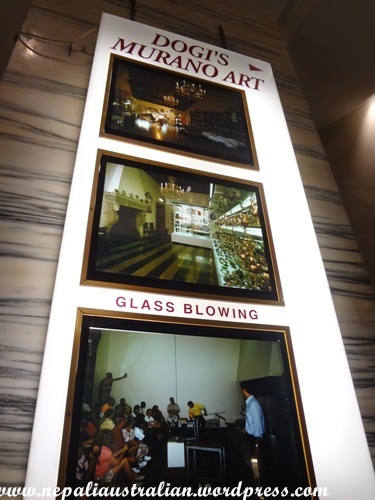 All of the jewellery stores buy their beads from Murano and make their accessories in the shops. Venice is like no other place on earth as no cars are allowed in the city and the fastest way to travel within the city is by boat on the canals. 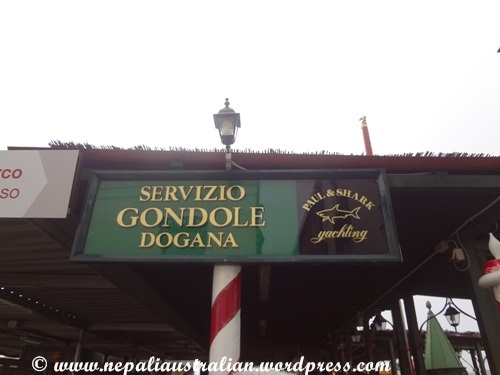 So we went to ride a gondola. 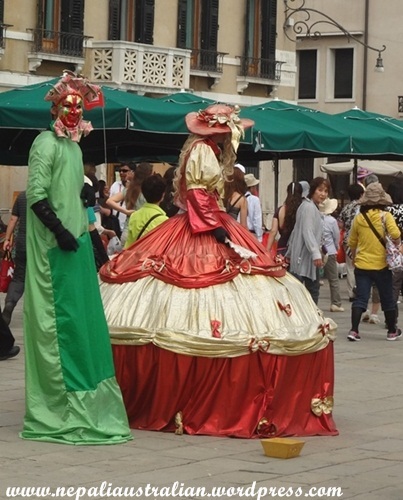 It is one of the most popular things to do while in Venice and we were there for the first time so it was really fun. The boats were beautiful with decoration and cushions. 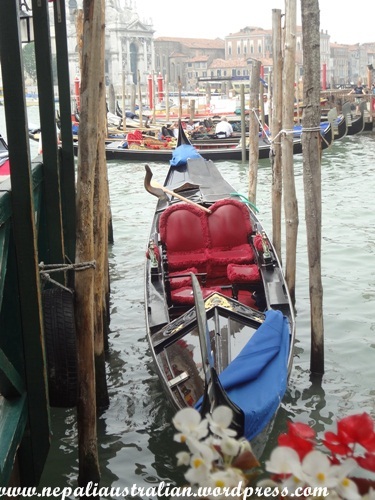 There were a few different types of gondolas and it was so nice to sit and enjoy the romantic experience. 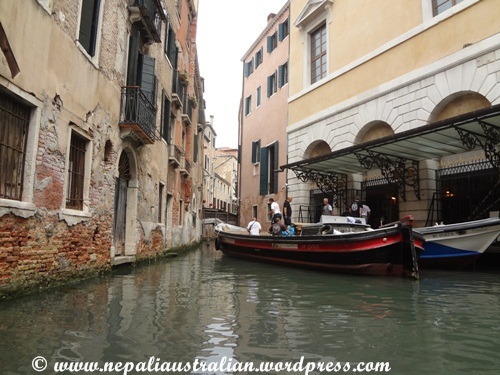 It’s true that the best way to see Venice’s gorgeous palaces is from the canal. 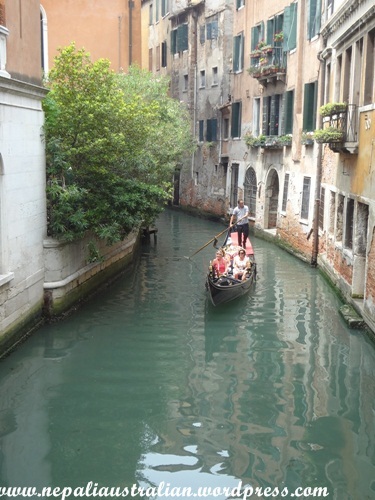 Once on the boat and away from the hustle and bustle of the square, we could just enjoy the ride listening to the beautiful serenading by our gondolier. 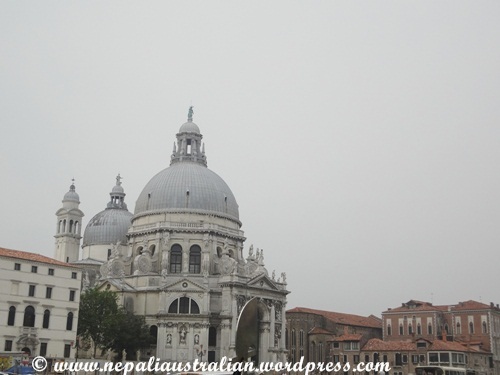 Grand Canal is the largest canal in the city which is almost 3 km long and up to 70 metres wide. Many famous buildings are situated on its banks, including the baroque church of Santa Maria Della Salute, the Accademia Gallery, the Ca’d’Oro and the Grassi, Corner-Spinelli and Grimani Palaces. It is crossed by three bridges: the Accademia, Rialto and Scalzi. 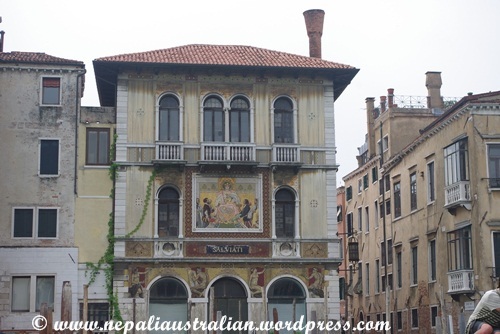 The most famous of these is the Rialto, lined with a double row of shops. Our guide told us that gondoliers, uniforms were changed after the film Summertime where Katherine Hepburn put them in striped shirts with corn hats. We also went to the balcony where Johnny Depp and Angelina Jolie shared a kiss in the Tourist and the building that James Bond blew up in Casino Royal. Once the boat ride was over, we had a whole day to discover the Vience on our own. 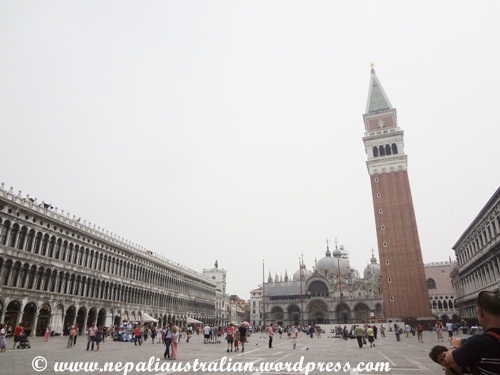 Standing in the middle of the magnificent piazza San Marco was really amazing. There was the hustle and bustle of tourists everywhere. 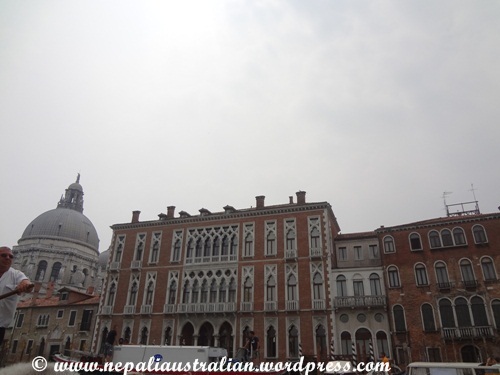 There is St Mark’s Basilica in one corner, Piazzetta dei Leoncini on another as well as Procuratie Vecchie (Old Law Courts), Procuratie Nuove (New Law Courts) and Clock Tower. Standing on the middle of it all, I felt so happy to be in a place I always wanted to come to and had heard so much about. In the San Marco there were so many pigeons and I decided to stop and take some photos with them. 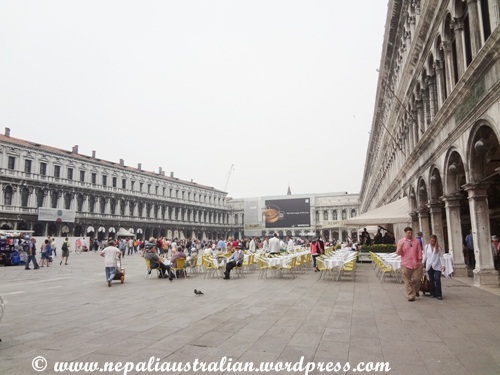 It reminded me so much of Kathmandu Durbar Square. 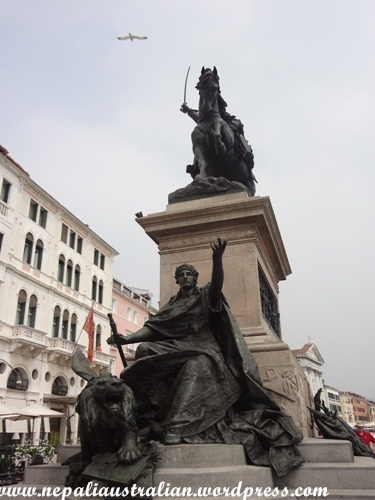 The piazza San Marco is equally beautiful in day as well as at night. From there we took a walk and went souvenir shopping. 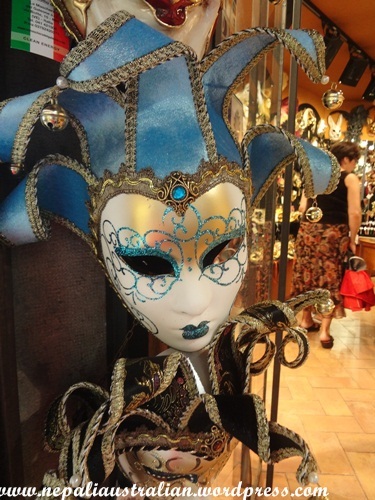 We ended up buying some Venetian masks, a Gondola, key rings and a few other stuffs as well. There were so many choices that you kind of get lost in the shops. Also we saw so many people wearing mask and asking money to take photos with them. It was almost midday by then so we decided to have something to eat. 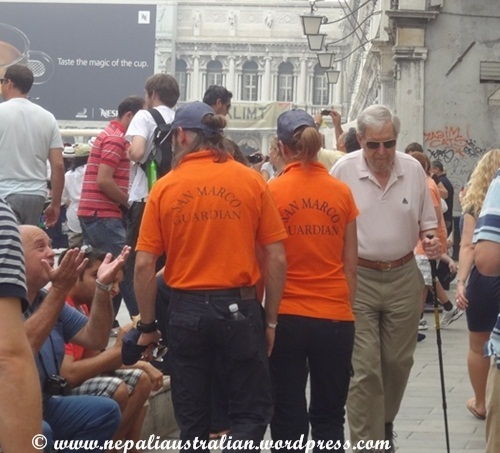 Our guide had warned us not to sit down in a café as they are super expensive so we decided to get a Sandwich and coffee from a take away shop and went to Piazza San Marco. We had tuna and egg sandwiches and they tasted great. 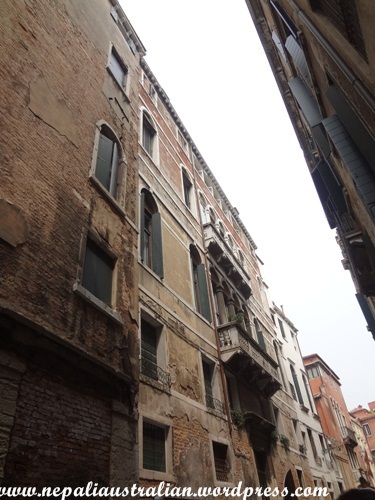 As we were enjoying the view and eating our lunch, two girls wearing orange shirt that said “San Marco Guardian” came to us that sitting out in the public place in the area was not allowed. I was a bit annoyed but as our lunch was almost over, we just got up and went for more sightseeing. We went to so many small squares and bridges. 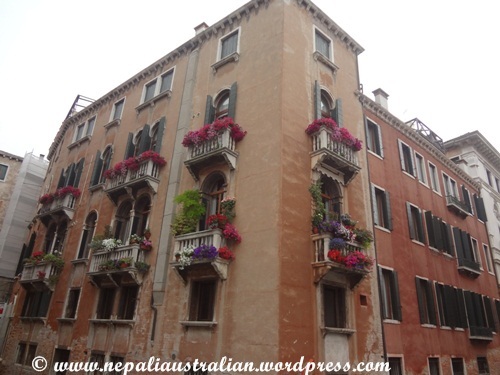 The houses were pretty with flowers on the balconies. So many designer and leather shops were everywhere making it a heaven for shoppers. I tried my best to avoid fashion shops as I had already bought so many shoes and dresses the day before. I ended up buying a hat as it was hot and I forgot mine in the hotel room. It was really hot and humid day so I was really tried after few hours so we decided to go to the port and wait for our boat to take us back to the mainland. While we were sitting at the edge of the water, one of our tour friends took this photo for us. That is one of my favourite photos from the day. 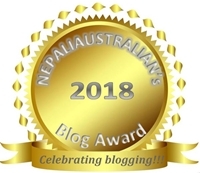 This entry was posted in Italy, Travel and tagged Corner-Spinelli, Gondola ride in Venice, Grimani Palaces, piazza San Marco, Procuratie Nuove, Santa Maria Della Salute, the Accademia Gallery, the Ca'd'Oro, the Grassi. Bookmark the permalink. Oh, wow ! The mask ! ! 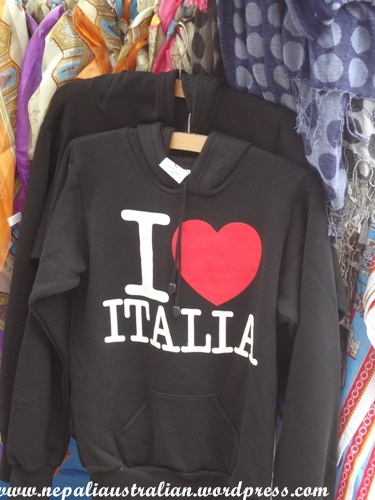 We bought exactly one like that… I mean exactly ! ! 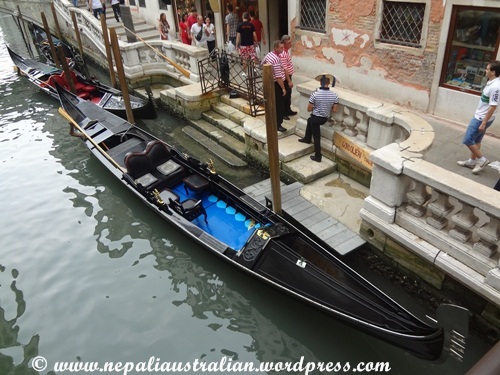 including color… check out my post on Venice … Weird. You had such an amazing trip!